I. 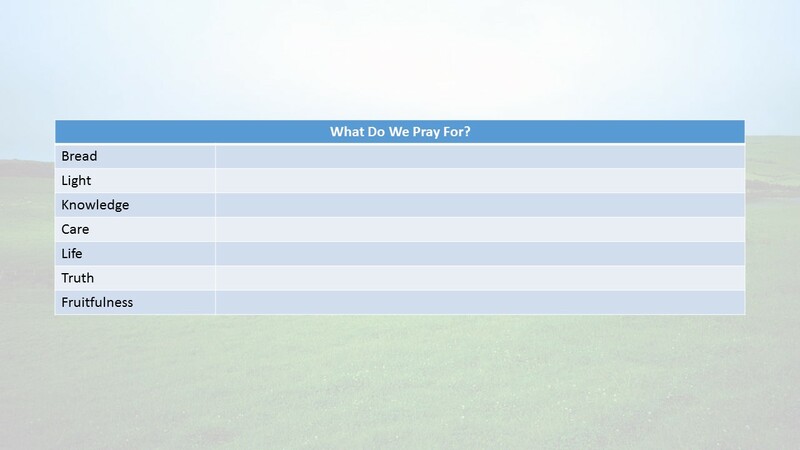 Introduction – Why do We Pray? First of all, I want to apologize for my absence recently. It’s been a difficult month for me. My stepfather was a warm, loving father who taught me much about the meaning of family and forgiveness, and he was also the first close family member to me that passed. I learned much about prayer this month. At the funeral, they handed out this card, and more than one Christian brother remarked to me that the verse on the card and the verse assigned to me to study this week are the same. There are a total of 31,102 verses in the bible, yet God singled out 6 of them for me. One of the questions I asked myself is, “Why do we pray?” We’ve given admonishment before that God is not some sort of magic genie and we are granted 3 wishes, yet in the midst of our trials, we go to God and start asking for our 3 wishes. In the same way the Spirit also joins to help in our weakness, because we do not know what to pray for as we should, but the Spirit Himself intercedes for us with unspoken groanings. In my case, sometimes I imagine the groaning of the Holy Spirit comes with an eyeroll of the Holy Spirit. Groan, Michael never gets this prayer right, I’ll have to fix it for him. Again. So God, being perfect, knows what we need before we ask, and if we get it wrong, intercedes for us and prays for the correct thing. So why do we pray? When we pray for God to do something for us, knows in advance and corrects our prayers, so why do we pray? Do we think our prayers are somehow going to change God, when it is God who is perfect and we are fallible? When we pray and ask God to change, then we miss the most powerful aspect of prayer. Pray doesn’t change God. It changes us. It brings us in line with God’s will, His plan, His desire. Our goal in prayer should not be to put together some sort of compelling argument so that God will answer our prayer. Our goal should be for God to bring us in line with His will so that our prayer and God’s will align. When we are in line with God’s will and covered by the blood of Jesus Christ, we are seen as righteous before God. And James 5:16 says the prayers of a righteous person is very powerful. Not because we are powerful or even righteous, but because He is powerful. It’s important that we pray; if we look at the rest of James 5:13-18, James gives a lot of insight into the purpose of our prayers. We’re not telling God anything that He doesn’t know. But God wants us to acknowledge Him in all our ways, through good times and bad, through times of plenty and times of famine. When Jesus gave us the Lord’s Prayer, the prayer was given as a “model” prayer. It was never intended to be mere words, quoted over and over; the same chapter two verses earlier, Jesus cautioned us not to let prayer become “meaningless repetition.” Instead, God wants is to open our heart, go into our closet and have a private conversation. Just God and me. What do we ask for if God already knows? 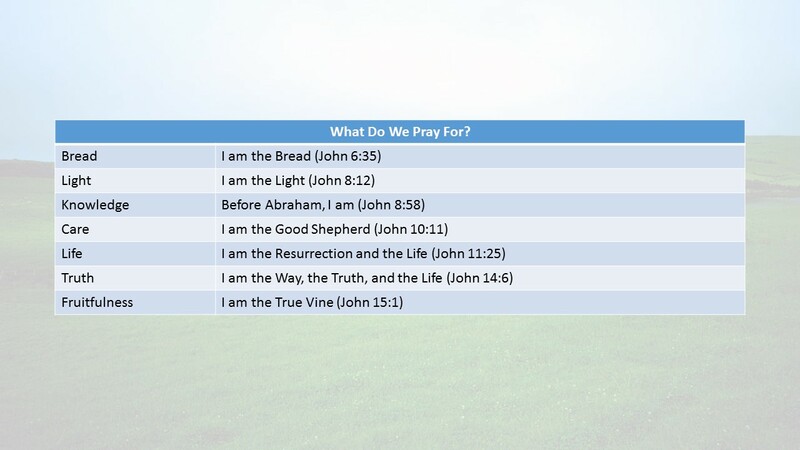 The New Testament has many verses that tell us what God wants us to pray for. So we should be honest. We should pray what is on our hearts. And above all, we pray that it is not our will, but Thy will be done. Because if we’re honest, we don’t always like it when we don’t get our way. This list above are all good reasons for us to pray, and answers to those prayers seem to be within God’s will, but then sometimes God is silent. Or God says no. Sometimes God says no when we pray about our finances. Sometimes God says no when we pray about our health. And some of the toughest prayers are when we pray about life itself. In Genesis 5, the descendants of Adam are listed. At the age of 130, Adam had a son Seth, and Adam then lived till the age of 930. Seth had a son Enosh when he was 105, and then lived to 912. Enosh lived to 905, his son Kenan was just a young child at the age of 70 when he fathered Mahalel. And so on until Noah; Noah was 500 years old when he fathered Shem, Ham, and Hapheth. So why don’t we live until the ripe old age of 900 years? Why do we die? It seems to me that God has a purpose for death. We have a deadline sometime in our life to accept the sacrifice of His son. We don’t know when that deadline is, but it is surely less than 120 years. And this limit is because of our own sin nature. We are limited in days because of God’s mercy and protection from this fallen world. So when my stepfather was moved to hospice last month, there were many days God interceded in prayer. Maybe I overthinked it. Overthunked it? Do I pray for my stepfather to continue living so we can enjoy his company for a while longer? Do I pray for his release from pain? We loved him so much none of us wanted to see him suffer, yet we loved him so much we didn’t want to see him go. And it was at this point, this fork in the road between two conflicting prayers of life and death I found myself, marked with tears of grief either way. And I know that God answers some prayers the way we hope about health and life and death, but eventually death comes to us all, and we are marked for eternity by the choices we make. I’m thankful the Holy Spirit intercedes with groans. And eyerolls. I know that God provides peace that surpasses all understanding, but I couldn’t figure out how to get from grief to peace. I needed God’s guidance, I needed God’s comfort, and I realized the fork in the road wasn’t between life and death. When I prayed for God’s will to be done, I realized the third option was not life, not death, but life everlasting. There is peace knowing that Jesus Christ rescues us from death and gives us eternal life, and that I know I will see my stepfather again in heaven, where there is no pain and there are no tears to wipe away. This life offers many challenges, and when we are younger, I think we believe we can win them all. But age and experience teaches us that we cannot win over all our enemies, we cannot live without the impact of illness, we do not always feel blessed by abundance and opportunity, and grief and sadness will come to all of us. Kind David had a full life. We’re familiar with his childhood, full of braggadocio and power. His faith was so pure that God enable David to bring down the giant Goliath with just a stone. We’re not sure when David wrote Psalm 23, but no doubt David had already experienced grief and heartache few can bear. It’s only 6 verses, but they’re powerful verses. Such a beautiful prayer. It speaks not just of our life now but our confidence in a life everlasting with our Lord Jesus Christ. It’s interesting to me that this Psalm is part of a Messianic trilogy. Psalm 24 / Chief Shepherd Lift up your heads, O you gates! Lift up, you everlasting doors! And the King of glory shall come in. 1 Peter 5:4 And when the Chief Shepherd appears, you will receive the crown of glory that will never fade away. The Kings crown Future His future return for His people as the King of Glory! Let’s look at Psalm 23 in a little more depth. The Lord. Every word in the bible is important. Jesus is Lord. We sing songs about Jesus being our friend and our savior, and those are true, but he is also Lord. The Lord’s name is Yahweh, sovereign, almighty, delivering Lord God. When we seek comfort, begin by acknowledging that He alone is Lord of all. Is. Jesus is my shepherd right now. Yes, he was there in the past, and yes, He will be there in the future, but Jesus is the great I AM. He is here now within our midst. My. Jesus is personal. He’s not a figurine hung on a cross in the front of a church. He is not an abstract idea of goodness, He is not simply a long dead teacher or morals. He is Mine, and I am His. Shepherd. Jesus is our shepherd, and we are His sheep. What’s interesting about sheep is they are 4D. They are dumb; if there was a school for farm animals, sheep would be dropouts. If there is a wire fence, they will get their necks caught in it, not just today, but tomorrow, too. Their wool smells like you’d imagine a wool coat would smell if you left it in the rain, they have no ability to defend themselves, they have terrible eyesight, they are fearful skittish creatures that are prone to wander and get lost. No wonder we need a shepherd who will provide for us, protect us, guide us, and wash us clean as snow. Don’t get confused; David isn’t saying, “I don’t want a shepherd.” The word “want” here means “needs.” If the Lord is my Shepherd, then there is nothing else I need. The Lord Jesus is all sufficient, and I place my trust in Him. There may be trials of all sorts ahead for us, but the Lord uses everything for good, and I will trust in the Lord to provide everything I need for the day he has given me. Everything will be ok. When our bodies are tired, we put them to bed. A nice comfy bed and a soft fluffy pillow, and we rest. The Lord does this for our soul, if we only let him. If we follow the Lord, our soul can be still and know that He is God. When we rest in Him and leave our troubles with Him, He restores our soul. God’s word is a lamp for my feet, a light on my path. He teaches me to be righteous so that I may bring Him glory. I cannot do this on my own, but I can do all things through Christ who strengthens me. If I am following my Lord’s direction and letting Him guide my path, then the Lord receives the glory due to Him. This world is not the valley of life. This world is the valley of the shadow of death. Death comes to us all, no more than 120 years and for most of us a lot less. My hope alone is in Him so that one day I may walk in new life. But when you are surrounded by evil, God is not a distant third party. We can talk to Him directly. David talks directly to God, saying, I have nothing to fear for my hope is in you. You surround me, you comfort me, you love me. And if you are for me, then who can be against me? The Hebrew word here translated “rod” can also be translated as rod, scepter, and weapon. It is not a “walking stick.” A shepherd’s rod is about two and a half feet long with heavy pieces of iron embedded on the end, like a mace. The rod is the shepherd’s primary offensive weapon for protecting the flock from enemies, whether the threats are wild animals or human thieves. When used as a weapon, it is intimidating and deadly. The rod and staff mentioned in Psalm 23:4 represents God’s defense and His divine guidance. His rod is used to drive off our enemy, Satan and his minions. God’s staff is used as guidance to us, to lift us back on the pathway after we fall. The Lord protects me from my enemies, and rescues me from my own mistakes. God provides everything I need, despite the efforts of Satan to undo me. In fact, God provides an abundance for me so that my cup runneth over and I can provide blessings to others. Even though he is my Lord and my Savior, God treats me as an adopted son and an honored guest. If you trust in the Lord, then no matter how far you stray, the Lord follows you with goodness and mercy. The Hebrew word used for “follow” is the same word used when Pharaoh “followed” Israel across the Red Sea. It doesn’t mean goodness and mercy follows from a distance. God is actively pursuing us daily. God knows our lives. He knows us before we are born, He knows us through our final destination. He actively pursued us and rescues us. And while goodness and mercy may actively follow me, one day I am going to slow down enough so that he catches me, and I will dwell in the house of the Lord forever. Forever is a very long time. It’s far longer than the 120 years allotted to us. Our prayers bring us in line with the spirit of the Living God who comforts us and provides for all our needs; he is our shepherd, and there is nothing we shall want. I know that my stepfather dwells in the house of the Lord, and one day, I too, will dwell there, for Jesus promises there are many rooms in His mansion, and one day he will come back for me. No eye has seen, no ear has heard, no mind has conceived what God has prepared for those who love Him. I’ll leave you with these two verses from our hope and future in the book of Revelation. Open your bible to Genesis 15, and the first two words are, “After this.” After what? Ok, open your bible to Genesis 14. Let me summarize what’s happened with Abram recently. In Genesis 14, Abram’s nephew Lot had settled down with his family near Sodom and Gomorrah, hardly the best decision Lot had ever made. An intense geopolitical power struggle was going on, and I count no less than 9 kings and kingdoms that were at war. Four of the kings conquered and pillaged Sodom, and Lot was captured and hauled off as a slave. Abram made it clear that if and when Abram received all the things that God had promised to Him, that God alone would get the glory. “Do not be afraid, Abram. I am your shield, your very great reward. Now God says to Abram, you have chosen wisely. You have chosen a way that pleases me. The Lord your God will be your very great reward. And do not be afraid that the kings will return to attack, for I will also be your shield. Trusting in the Lord can be hard. We have our sense of self, our entitlements, our wants and needs, and we’ve placed them on the throne of our hearts as idols to be worshipped. We follow our idols instead of trusting in the Lord. We leave our church and bible study on Sunday morning, and by Sunday night we’ve forgotten what it was that resounded in our heart earlier in the day. God has chosen the foolish things of this world to shame the wise, and the weak things of this world to shame the strong. 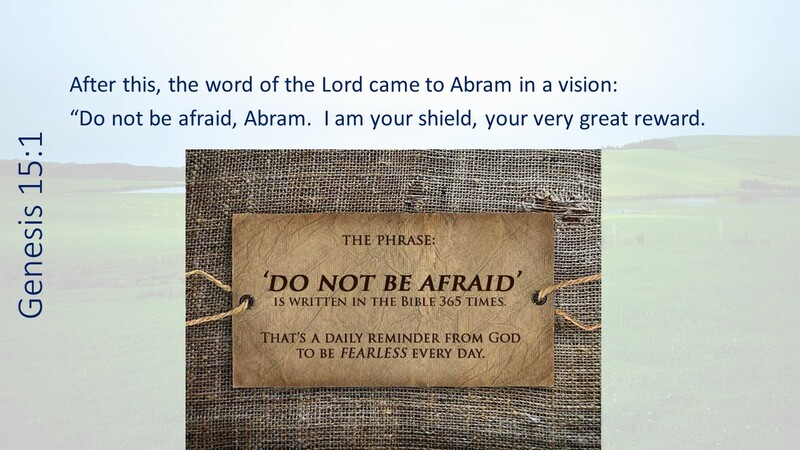 Now, after Abram’s battles with the four kings and then rescuing Lot, God comes to Abram and says, “Do not be afraid.” Did you know that in the bible, every time God says, “Do not be afraid,” He then tells us why we should not be afraid? This is the very first time in the bible, “Do not be afraid” is said. I read somewhere that the bible says, “Do not be afraid” 365 times, one for every day of the year, a daily reminder from God to be fearless in our Christian faith every day. But the second reason not to fear, God tells Abram, is truly amazing. Not only will God be Abram’s shield, God will also be Abram’s reward. Not just any reward, but an exceedingly great reward. There is no greater reward than God. Gold and diamonds are insignificant compared to the God who created gold and diamonds. Compared to God, all the plunder Abram just gave back to the King of Sodom is like dust. But what does it mean to have God as a reward? How can God be a reward? We belong to Him; He does not belong to us. How can God, the Creator of the universe, give Himself as a reward to humans, let alone a single person? Abram may have been confused by this as well. Maybe in his own mind, Abram is thinking, “God can’t mean that He will give Himself to me. He must mean He will protect me and provide for me. That must be what God means.” But that is not what God means. God means that God Himself is what Abram is seeking. God Himself is what Abram wants. God Himself is what Abram needs. God Himself is the missing piece of Abram’s life. God Himself is Abram’s exceedingly great reward. What do we pray for? We often pray for what we do not have but we think we need. We pray for physical needs like food or money. We pray for wisdom to make good decisions. Sometimes, when we do not understand what God is doing, we pray for understanding. We pray for encouragement when we feel the trials of life are overwhelming. We pray for protection from those who are against us. We pray for healing and life and health. We pray for truth and a better understanding of God’s plan. We pray for God to be able to use us. These are all good things to pray for. Are our prayers met the same way? I believe they are. In the Gospel of John, we find seven “I am” statements. Everything we ask, everything we imagine, everything we need or want is found in Jesus. We all want something from the Lord, but God wants us to want Him. We want some answer to prayer, but God wants to give us Himself. It is in Him, that all these other things are found. When Jesus Christ is our everything, we can go hungry, we can wander without direction, we can wonder how that bill will get paid, we can have health problems and family crises and still have a peace that passes all understanding because Christ is ours to hold. Jesus says we will live the abundant life if we find all we need in Him. Our minds are so earthly focused, it is hard to understand how just by loving Christ and enjoying His presence that we can have the contentment, joy, peace, and happiness that would never be ours otherwise – even were God to grant us all the things we prayed for. Isn’t that we often pray? “Oh Lord, thanks for everything, your promises, your comfort, your Holy Spirit. But what will you give me?” Abram wants a son. Then in Genesis 15:4, God promises Abram that Abram will have a son of his own. And not just a son, but more descendants than Abram can count. God and Abram go outside and look at the stars and says that if Abram can count them all, that’s how many his decedents will be. And Abram believed. Believe in the Lord, that He is who He says He is. He is the great I am. He has sent His son for the transgressions of our sins, and we are now washed clean in His sight. How can we know God keeps His promise? How do we know that when we die, that we have eternal salvation, freely available to all who believe? Abram is a great testimony. He believed God. God credited it to him as righteousness. Not because Abram was a great guy and has some nice sheep and goats, but because He believed. And Abram, on this expression of His faith, was declared righteous. Against all hope, Abraham in hope believed and so became the father of many nations, just as it had been said to him, “So shall your offspring be.” Without weakening in his faith, he faced the fact that his body was as good as dead—since he was about a hundred years old—and that Sarah’s womb was also dead. Yet he did not waver through unbelief regarding the promise of God, but was strengthened in his faith and gave glory to God, being fully persuaded that God had power to do what he had promised. This is why “it was credited to him as righteousness.” The words “it was credited to him” were written not for him alone, but also for us, to whom God will credit righteousness—for us who believe in him who raised Jesus our Lord from the dead. He was delivered over to death for our sins and was raised to life for our justification. In one of the great mysteries of this universe, at least to me, is that God keeps His promises to us. And if we only believe that Christ died for our sins, then God will forgive our sins and credit our belief to us as righteousness. It’s not about how fervently we pray, how many times we attend bible study, how often we do good things for those who can’t. We do those things out of love, but it’s not our prayer or our service or our worship that gives us salvation. It is our belief. God wants us to believe in Him. If Romans 4 tells us that Abram was the father of all Gentiles, then Jesus says that it was Abram’s faith in the future Messiah that brought Abram joy. Abram, as well as countess others throughout the Old Testament, are saved through their faith in the future Messiah yet to come. Abram believed in the coming Messiah for eternal life, and that the Messiah that would come through Abram and his descendants. It is at this point, when Abram believed the Lord that the Lord credited him with righteousness. When we believe God’s Word, that God gives eternal life to everyone who believes in Jesus for it, like Abram, we are declared righteousness by God. There is no other way to receive eternal life. Abram believed the promise, and so was justified. Of all the ways that God gives Himself to us, this is the greatest. God told Abram in verse 1, “I will be your great reward” and now Abram has received God’s righteousness as part of that reward. No matter what happens in life, if we have Jesus, if we have God as our reward, we have more than everything we need. The promise has been given, the promise has been believed, and now we will see the promise guaranteed. Abram says, “Well, ok, God, I trust you that you’re going to give me a son. But how can I know you’re also going to give me the land?” Abram is already 85 years old at this point, and he and his 318 men in his army aren’t getting any younger. God then makes a covenant with Abram, a complex scene that involves sacrificing animals and dividing them in half. Some commentaries tell me that this symbolized a way back then to seal a deal. The two people would sacrifice and split their animals in half, then walk in between the pieces. The thought was that, if I break my side of the covenant, may I become like this sacrificed animal and be split in two. Now in these more modern days, we are much more civilized. We don’t divide animals in half. Now it’s the lawyers who are animals trying to divide the people in half. But I digress. This is a prophecy about the future. God has delayed his promise in order to show Abram, and show the Israelites that it is not by their effort that His covenant will be fulfilled. It is by God’s faithfulness alone His promises are fulfilled. God tells Abram that his descendants will go to a land that is not theirs and be slaves for 400 years. When that time is up, the nation they serve will be judged. Abram’s descendants will then come out of the land with great possessions. Before all of this happens, Abram will die in peace. Why is God telling Abram this? Because the promise of the land will not be fulfilled in Abram’s time. Abram may be getting impatient to get some of the land that God has offered to him, but God says that the promise of the land will only be fulfilled with Abram’s descendants, long after Abram is dead. The reason for this is because the iniquity of the people dwelling there is not yet complete. And when God walks through this covenant alone, God is saying that He alone will fulfill this covenant. No matter how Abram sins or fails to live up to God’s standards, God reassures Abram that God’s promise will be fulfilled. Just like our relationship with Jesus Christ. It is a one sided covenant. God asked Abram to bring the animals, which Abram did. But God walked through them alone. God asks us to believe in Jesus Christ for eternal life. But God paid the penalty, bought our salvation, and guarantees it all by Himself. God requires nothing from us except to believe in Him and have it credited to us as righteousness. He does not demand anything of us. Eternal salvation is a one-sided covenant which cannot be broken. God does it all. God does not meet us half way. God doesn’t even meet us most of the way. God does it all. We do nothing. In legalistic churches and groups, we talk about being committed to Christ, about the works we must do to secure our salvation, about have a Christian must say, believe, and do certain things. But God’s covenant with us reveals something else entirely. We aren’t the promise keepers. God is. He makes the promises to us, and He keeps them all by Himself. We don’t give ourselves to God. He has already given Himself fully and completely to us. We don’t make covenants with Him. He makes covenants with us, and there is only one name to sign on the bottom – His. Are you still trying to win your salvation? Are you still trying to prove that you’re worthy enough to enter His kingdom? It’s time to lay those burdens down at the foot of the cross. Just trust in the Lord. Trust in His unconditional promises to you. Don’t try to meet God half way. Let Him do it all in you and through you for His good pleasure. We talk about “accepting” Christ, but this a term not found in the bible. What we “accept” is an understanding that God has called us and is calling us. We realize that we are wretched and naked without God. There is nothing we can do to clothe ourselves on our own, but we trust in the Lord, trust in the promise of Jesus that when we put on Christ, we are then clothed and beautiful. Perhaps we do not feel our prayers being answered today, but God will fulfill each and every promise He makes. And when we feel that when we have found Christ, our journey is not complete. We find Christ so that we can seek Him more. We accept Christ so we can accept Him more. We acknowledge Him as our Lord so that He may command and lead us to pastures green, the land He promised unto Abram, and the salvation promised unto us. We covered Esther in two weeks and Ezra in two weeks, like we were in a hurry. But we’re going to slow down and spend the next several weeks in Nehemiah. 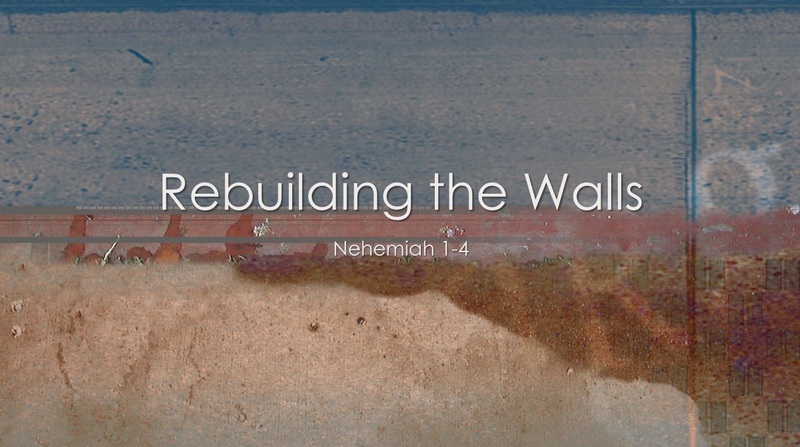 Let’s dive right in with an introduction to Nehemiah, who he is and what he’s doing. The Jewish people had sinned and God had judged them; it was approximately 605 years before Christ. God used Nebuchadnezzar II, King of Babylon, to invade Judah and lay siege to Jerusalem. In 597 BC, the prophet Ezekiel (who we studied just 2 months ago), documented the pillaging of Jerusalem and the deportation of Jews to Babylon. Nebuchadnezzar installed Zedekiah as the tributary king of Judah. However, despite Ezekiel’s warning, Zedekiah entered into an alliance with Pharoah Hophra of Egypt. Nebuchadnezzar II responded by sacking Jerusalem a second time in 587 BC and destroying Solomon’s temple. The Jewish king Zedekiah was forced to watch his two sons executed, then the king’s eyes were put out and the king was imprisoned until his death. The remaining healthy Jews still in the city were taken to Babylon, leaving behind only the weak, the poor, the sick. The city of Jerusalem was raised to the ground. Thus began the Diaspora of the Jews which continues to this day. The Diaspora refers to Jews that live outside of the Kingdom of Judah. Today, about 44% of the world’s Jewish population lives in Israel, the rest are the Diaspora, Jews scattered mostly in the US and Western European countries. The Jewish people lived as servants in Babylon, and many, like Daniel, Mordecai and Esther, and Nehemiah proved themselves trustworthy and faithful. They understood the exile as a consequence for their sins. Fifty years go by, and the king of Babylon is now Cyrus the great. 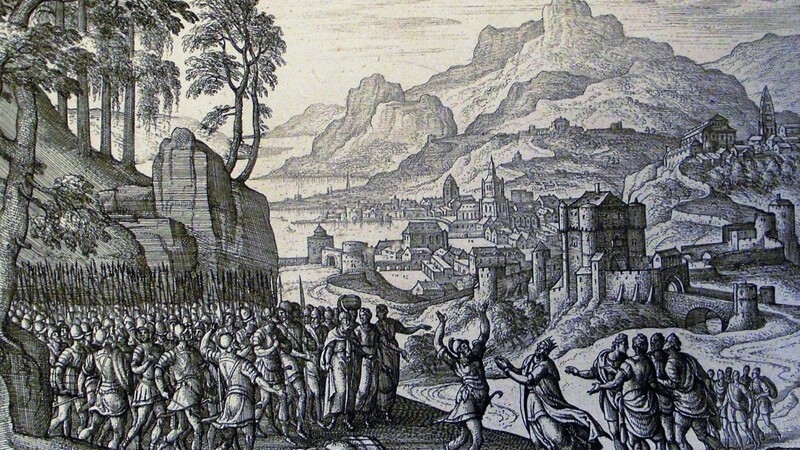 In 538 BC, Cyrus’s Declaration was issued which permitted Jews to return to the land of Israel. Then began the return to Zion, called Aliyah by the Jews, which continues to this day. 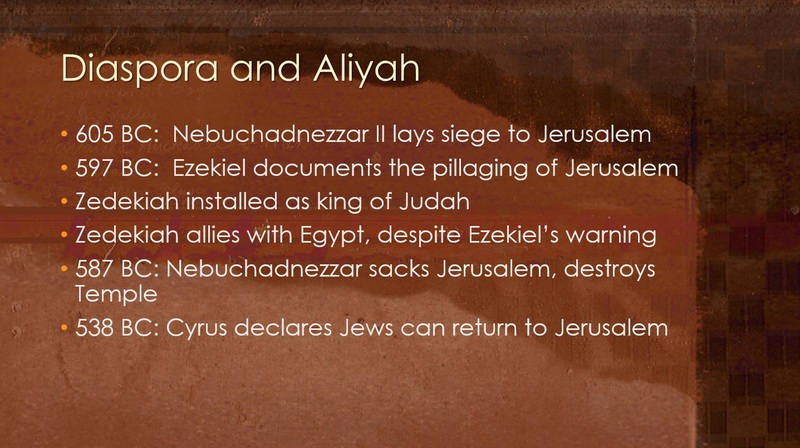 In Nehemiah’s time, there were 4 waves of Aliyah, returning to Zion, after Cyrus’s Declaration. The prophet Ezra tell us the first Aliyah was small, approximately 1000 young Jews led by Sheshbazzar to rebuild the holy temple on the temple mount in 538 BC. 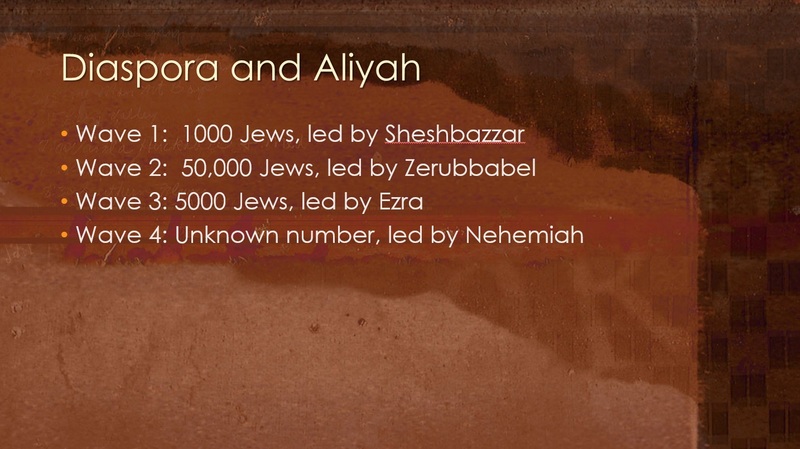 The second Aliyah was larger, later that same year, and led by Zerubbabel, and totaled nearly 50,000 people. A third Aliyah was led by Ezra himself when Ezra was an old man, years later in 458 BC, and 5000 additional Jews returned to Zion. Ezra strengthened religious laws and the use of the Hebrew alphabet which was critical to the identity of the Jewish people as separate and holy. The book of Nehemiah chronicles the life of Nehemiah and the fourth wave of Aliyah. In the book of Nehemiah, chapter 1, Nehemiah identifies a mission, a service to the Lord, and we can learn much about how he learns of his mission, how he prepares for his mission, and how he executes his mission. Let’s look at Chapter 1, and I love the way this book begins. It identifies Nehemiah’s mission and right away how he approaches God. Nehemiah learns that the place of his ancestors is in poor condition and in need of help, and it moves Nehemiah to tears. Nehemiah cried and fasted and prayed to God, and his prayer is a study on how to pray. There is praise and worship, there is confession, there is adoration and supplication and application of scripture. Nehemiah was a man of prayer which is also why I believe he was also a man of action. God was with Nehemiah because Nehemiah was constantly with God. Nehemiah did not act without praying first, and did not pray without acting. Nehemiah is the king’s cupbearer, a position of no small importance. Wine presented to the king would first pass through Nehemiah, who would taste the wine for signs of poison. Nehemiah, as cupbearer, would be in nearly constant presence of the king, and so would also be an unofficial advisor with the king’s ear. And again Nehemiah shows us why he is such a man of God. He’s been praying for 4 straight months, but when he is finally in the right place, right time, in front of the king, verse 4 says Nehemiah first prayed to the God of heaven, and then answered the king. We don’t know the content of this prayer, but by necessity it had to be a short prayer. Maybe it was “Lord have mercy” or “Thank you O Lord” or “Lord be with me” or “Your will be done, O Lord.” It shows that Nehemiah knows this meeting with the king is the answer to his prayer in Chapter 1, and Nehemiah is going to go to the Lord before he says or does anything. Is anyone among you in trouble? Let them pray. Is anyone happy? Let them sing songs of praise. Is anyone among you sick? Let them call the elders of the church to pray over them and anoint them with oil in the name of the Lord. And the prayer offered in faith will make the sick person well; the Lord will raise them up. If they have sinned, they will be forgiven. Therefore confess your sins to each other and pray for each other so that you may be healed. The prayer of a righteous person is powerful and effective. We are only righteous because of our faith and obedience to Christ Jesus, not of our own doing. But it pleases the Lord to answer the prayers of the righteous. Nehemiah prayed for months. Sometimes he prayed aloud, other times he prayed silently. Nehemiah prayed patiently for 4 months. How long is patience? Is being patient waiting for 4 months? While 4 months is a long time, you and I may have prayers that last longer than that. I know I do, and I have unanswered prayers that go on for years. How long is patience? I think it’s always 1 more month. Or 1 more year. Or 1 more whatever. Just keep praying. God always answers prayer. Sometimes the answer is “no” or maybe the answer is “not yet,” and it’s not the answer we were looking for. But we go to God in prayer, in faith that the Creator God of the Universe can answer it. Even when the Lord is answering prayer, obstacles may still exist. Often those obstacles are people, naysayers, they tell you it cannot be done or that it’s not worth doing. Or that your God is a little god and isn’t really on your side. But our God is an all-consuming fire. We can do all things through Christ who strengthens us. And when God is for us, who can be against it? Nehemiah led the fourth Aliyah to Jerusalem to rebuild the walls, knowing God was answering prayers. Let’s take some time out to examine the work before Nehemiah. He’s rebuilding the city walls for two reasons. One is to protect the small Jewish community that returned to Jerusalem from attack; the walls had collapsed or been torn down, leaving little or no defense. The other reason is to bring glory to God; this was city of the temple of the Lord. You might think Nehemiah chapter 3 looks boring with its list of gates and builders. And if you read Nehemiah 3 by itself, I might agree with you. I’d rather watch old reruns of “home Improvement” with Tim Allen that read this old boring list of people building gates. But you may have heard that every word of the bible is important, so let’s dig a little further and see if twelve gates of Jerusalem are described anywhere else in the bible. If we read all the way to the end of the bible, we find the twelve gates of Jerusalem are described in Revelation 21. One of the seven angels who had the seven bowls full of the seven last plagues came and said to me, “Come, I will show you the bride, the wife of the Lamb.” And he carried me away in the Spirit to a mountain great and high, and showed me the Holy City, Jerusalem, coming down out of heaven from God. It shone with the glory of God, and its brilliance was like that of a very precious jewel, like a jasper, clear as crystal. It had a great, high wall with twelve gates, and with twelve angels at the gates. On the gates were written the names of the twelve tribes of Israel. There were three gates on the east, three on the north, three on the south and three on the west. The wall of the city had twelve foundations, and on them were the names of the twelve apostles of the Lamb. The twelve gates of the New Jerusalem have their origins in the twelve gates of the Old City of Jerusalem, and suddenly we realize that we’re not just studying Nehemiah restoring Jerusalem, but it is also a prophetic picture of God restoring His church, the spiritual City of God. Revelation goes on to describe each door as a single pearl, but we also know that Jesus is the pearl of great price. Revelation is written with some amazing imagery and symbolism, and the one of the keys to understanding Revelation is to understand the Old Testament picture first. Each gate had specific meaning to Jews in their daily life, and each gate has a spiritual meaning for Christians. The Sheep Gate, rebuilt by Eliashab the high priest. The Sheep gate led to the sheep markets where lambs were sold for sacrifice in the Temple. The gate also led to Golgotha, the path Jesus walked to His crucifixion. For Christians, the Sheep Gate is the first gate into our lives, where we accept Jesus as the perfect Lamb of God who takes away the sins of the world. Jesus is the door by which everyone must enter to be saved. 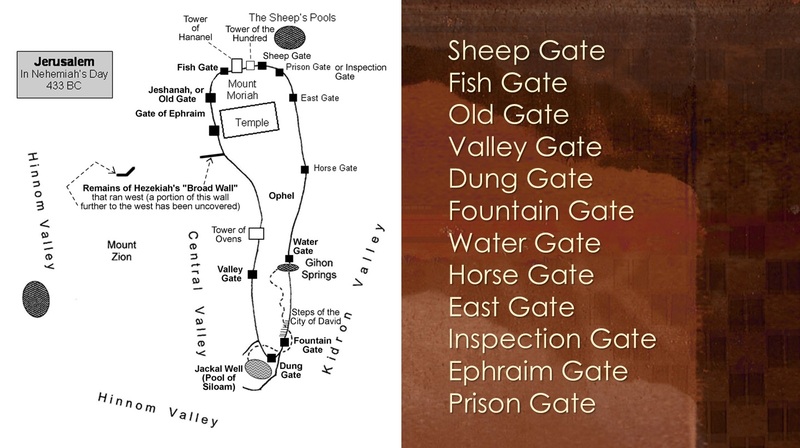 And if we read all the way to the end of Nehemiah 3, the last gate mentioned is the Sheep Gate. We’ve come full circle around the walls of Jerusalem, and realize that everything starts and ends with Jesus’ death on the cross. Jesus is our high priest that restores our relationship with the Lord. It’s interesting to me that when Eliashab rebuilt the Sheep Gate, Nehemiah 3 says they “dedicated it and set its doors in place.” Every other door we’re going to study says they rebuilt their gate and set the doors and bolts and bars in place. The Sheep Gate has no locks on it. The sacrifice of Jesus is always open to every sinner, and access to the other gates is impossible without first accepting Jesus. Also, look how much work Eliashab did rebuilding the Sheep Gate. They went as far as the Tower of the Me’ah or the Tower of the One Hundred and to the Tower of Hananel which means “God’s mercy.” Remember when Jesus said if a shepherd loses a sheep, he’ll leave the other 99 and go look for it? Between the Tower of God’s Mercy and Jesus looking for His lost sheep, God is calling to us. And we’re 3 verses into this list of gates and builders and we realize there is great meaning in this list of gates and builders. The Sheep Gate is the Gate of Salvation. Next to the Sheep Gate is the Fish Gate where merchants brought fish to the fish market. Jesus told Peter, “Follow me, and I will make you fishers of men.” After receiving the Lamb of God through the Sheep Gate, God begins to use us to reach other unbelievers. The Fish Gate represents the Gate of Witnessing, of spreading the message. And if you look at verse 5, the fish gate was “repaired by the men of Tekoa, but their nobles would not put their shoulders to the work. “ Jesus didn’t come to spread the good news to the rich, but was born in a manger, among the common people. During the ministry of Jesus, He gave us many warnings how wealth can hinder our walk with Him. Whether rich or poor, the message is for everybody. 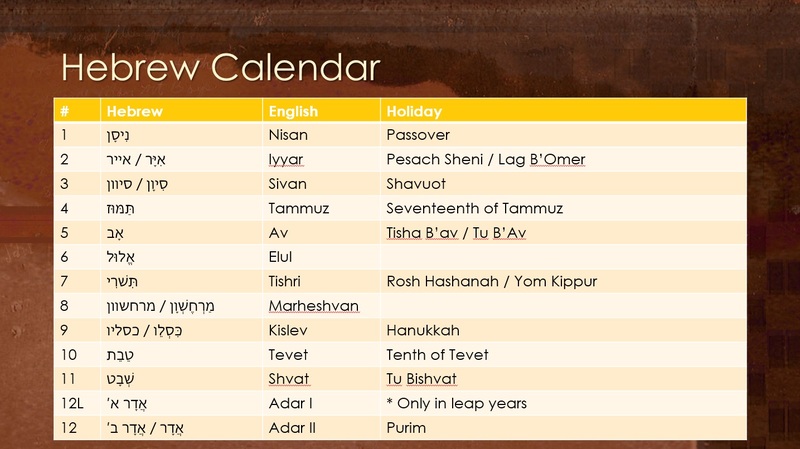 The third gate is the Jeshanah Gate which means the Old Gate. This is where elders of the city would meet to discuss important matters and issue judgments on disputes. God’s truth never changes, it’s as old as time itself. Jesus is the same yesterday, today, and forever. And the wisdom of our elders should be respected. Let’s call this gate a Gate of Foundation. I started thinking of it as the Gate of the Old Testament. The Valley Gate led out to two main valleys that divided Jerusalem. To the west was the Hinnom Valley. The Ammonites had built an altar here to Molek and sacrificed children by fire. Josiah rendered the valley ceremonially unclean by spreading human bones over it in 2 Kings 23. The name itself “Ge Hinnom” is also used for hell itself, the Lake of Fire. The other valley is Kidron that Jesus crossed to go to the Garden of Gethsemane. In 1st and 2nd Kings, this valley was used to burn pagan altars and images during the cleansings of Jerusalem. The Valley Gate is a Gate of Suffering for Spiritual Growth, as Jesus showed us the night before his crucifixion. But though I walk through the valley of the shadow of death, I will fear no evil, for Thou art with me. Thy rod and thy staff, they comfort me. The Dung Gate. Yuck. The garbage of the city was taken out of this gate. Notice it also leads to the unclean Hinnom valley. It represents the sin in our lives. But the blood of Jesus cleanses us of all sin if we just accept Him. Then we can place all of our sin and shame at the feet of Jesus, whose blood cleanses us of all sin. The Fountain Gate, primary access to the Gihon Spring, the sole source of water to Jerusalem. All of the fountains like the Pool of Shiloah were fed from this spring. What do you think this represents to us? Jesus is the Fountain of Living Water. If anyone is thirsty, let them come to Him and drink. The Water Gate is the 7th gate, and 7 is the Bible number for perfection. This gate needed no repair. The water symbolizes the washing by the Holy Spirit. Later, in Nehemiah 8, Ezra will stand in front of the Water Gate and read from the Book of the Law to the people. The Horse Gate, where the King’s chariot passed through. In the bible, the horse represents both discipline (James 3:3) and warfare (Zechariah 10:3). Make no mistake, we are in a spiritual battle, for which we must put on the full Armor of God. The East Gate is also called the Golden or Beautiful Gate and it symbolizes the return of our Messiah and waiting on the Lord. In Zechariah 14:4 it says, “On that day his feet will stand on the Mount of Olives, east of Jerusalem, and the Mount of Olives will be split in two from east to west, forming a great valley, with half of the mountain moving north and half moving south.” The week before His crucifixion, Jesus spent each night on the Mount of Olives . Each morning he would enter through the East Gate. He later ascended to heaven from the Mount of Olives and will return the same way He left. At that time He will again pass through the East Gate into the city of Jerusalem. The Miphkad Gate. Miphkad apparently is a difficult word to translate, it means meeting place, muster point, appointment, numbering in a census, or inspection. Appointed Place or Inspection seems the best translation, and this is the final gate before the entrance to the Temple. It is the place where God calls his people together at the final judgment. The other two gates are mentioned later in Nehemiah. The Ephraim Gate is described in Nehemiah 12 and was associated with the Feast of Tabernacles which is God’s feast for the harvest of the last days. It means “Doubly Fruitful” and could refer to “Jew and Gentile” or “Earthly and Heavenly”. Prison Gate, in Act 12 Peter is led by an angel through this gate. All wickedness will be judged, and only those who have accepted Christ Jesus as their advocate escape punishment. The order of the twelve gates represents our spiritual growth. We begin at the Sheep Gate by the forgiveness of our sins by the sacrifice of our Savior. We become fishers of men at the Fish Gate and tell everybody about the Christ Jesus. The Old Gate is our foundation of our faith, the Valley Gate is our purification. The Dung gate is the rejection of our old life and sinful ways. The Fountain Gate as we drink from the Living Water of Christ Jesus, the washing of our sins by the Holy Spirit at the Water Gate. We put on the full Armor of God at the Horse gate to stand ready to fight the spiritual battles. We await the return of our Messiah at the East Gate. The final Miphkad Gate is a gathering of God’s people at the final judgment for eternal life, paid for by the blood of Jesus at the Sheep Gate. The diaspora of God’s people. We have been separated from God by our sins. The Aliyah of God’s people. We return to the Lord, our sins paid for by the blood of the Christ. 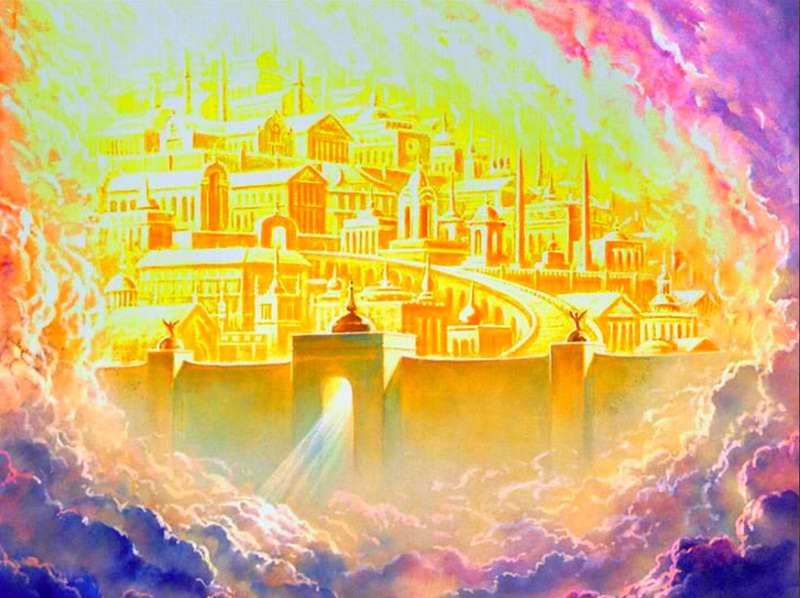 We are patient and prayerful until His final return, we gather for an eternity with Him inside the Twelve Gates of the New Jerusalem. When will this day come, the day of our resurrection and dwelling in New Jerusalem forever? We must continue to pray and be patient, for however long “patient” lasts. The day will come when I will stand with you, my brothers and sisters, inside the walls of the New Jerusalem and sing the praises of Christ our Savior.